My friend Roxy and I are seated at a table for two overlooking the lush Sicilian landscape. 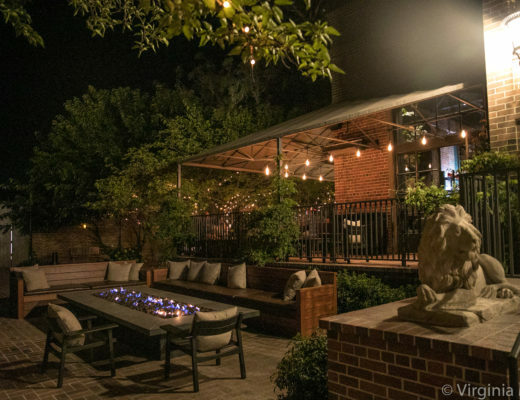 It’s dusk on a warm July evening, the stone terrace we’re seated on has soft, romantic lights and, save for one other table for two, we have the entire place to ourselves. 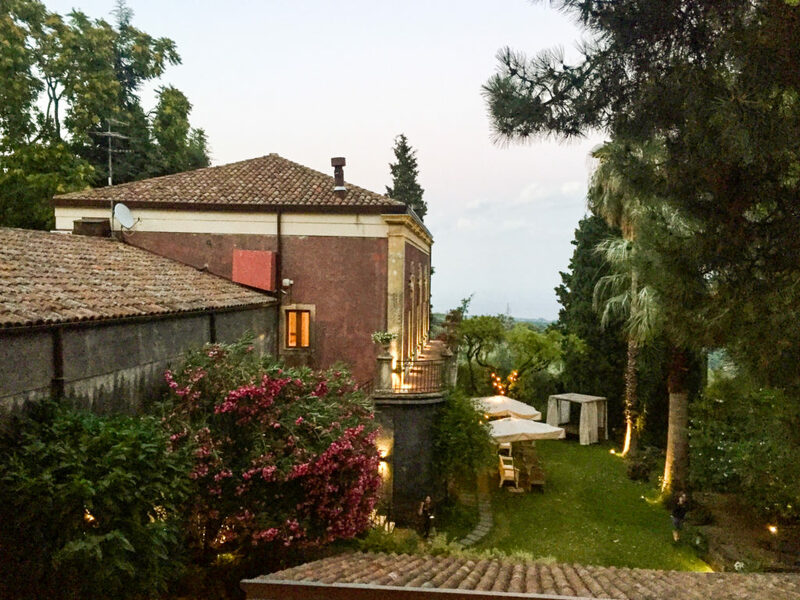 We’re at Monaci Delle Terre Nere, a boutique hotel, farm, and restaurant in the heart of Sicily’s Etna wine region, surrounding Mt. Etna, Europe’s most active volcano. 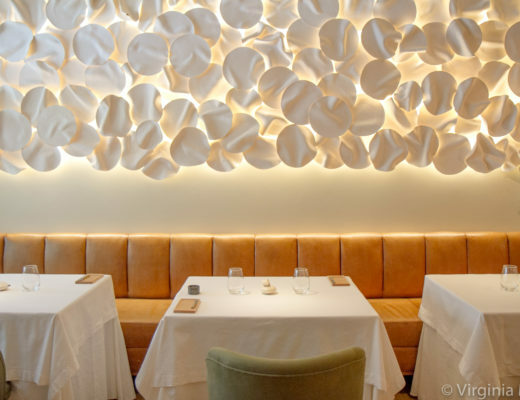 I couldn’t have imagined a more perfect setting for our meal, yet our server whisks us away to meet the proprietors, Guido Coffa and Ada Calabrese. Tonight, we would be dining with them, as well as Calabrese’s brother, who was visiting from Palermo. That’s the kind of thing that happens in Sicily: You quickly feel like family. 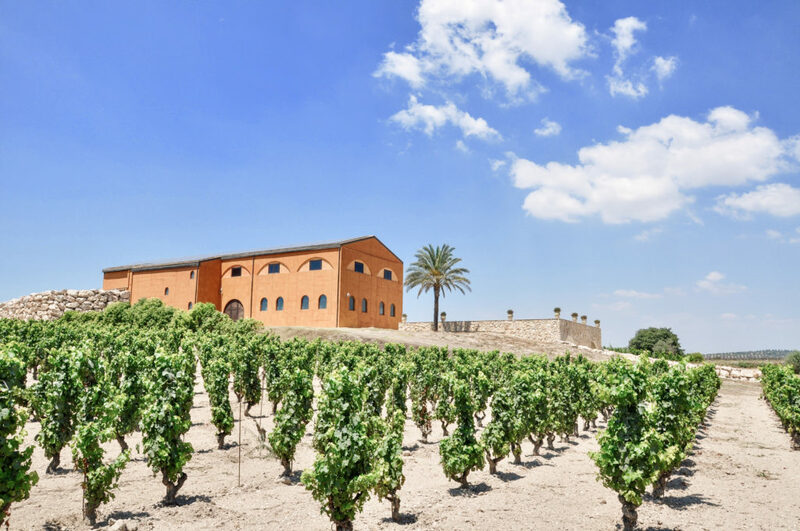 The boom of Sicily as a wine destination may seem like a relatively modern phenomenon, yet the island has actually been making wine for more than 3,000 years — well before it became a part of Italy. The Greeks were the first to grow grapes and make wine there in the 8th century. Since then, Sicily’s desirable location in the center of the Mediterranean Sea has tempted many a conqueror, from the Greeks to the Phoenicians, Arabs, Romanians, Normans and Spaniards, each culture leaving a lasting impression. 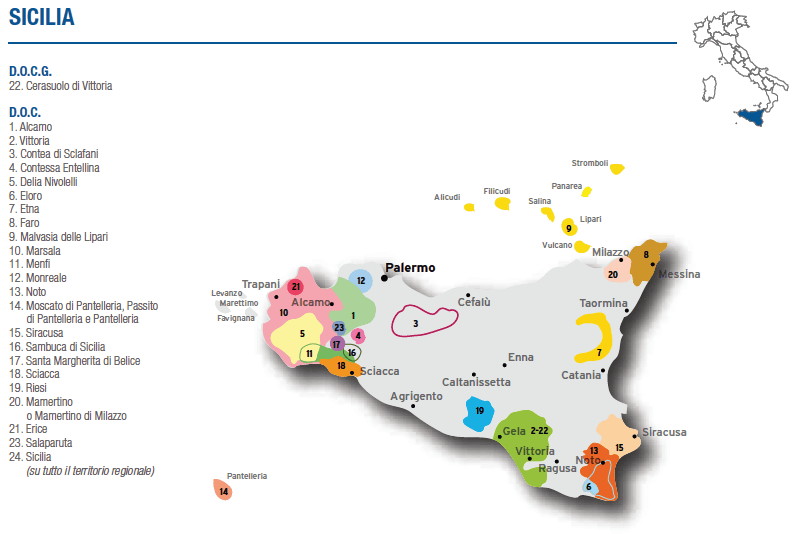 Wine is produced throughout Sicily, with 23 designated growing regions, each focused on its own native grapes and styles. In fact, 85% of grapes grown are indigenous to the island, with red grape Nero d’Avola (from Noto) perhaps the most recognized internationally. Another red grape, Nerello Mascalese, is the rising star from Etna, similar in style to the more well-known Sangiovese and Nebbiolo grapes from Northern Italy. The western coast is best known for Marsala production from the white grape Grillo, the famed fortified wine. The majority of the island’s production is white wine, but reds have been the primary focus when it comes to quality wine production. Until recently, much of the island’s wine was produced in bulk by cooperatives, selling to producers in Northern Italy and even France to supplement their wines. 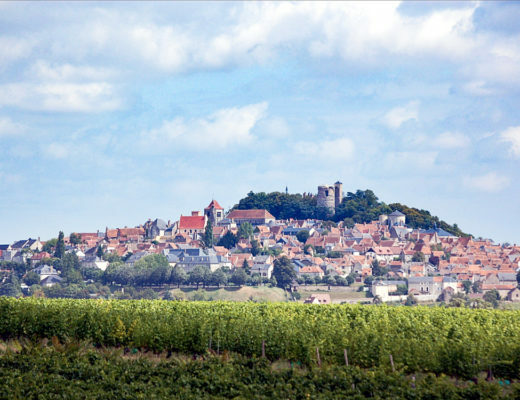 Yet, within the last 30 years there has been a dramatic shift toward making and bottling quality wines, with producers like COS, Frank Cornelissen, Benanti, and Donnafugata leading the charge. 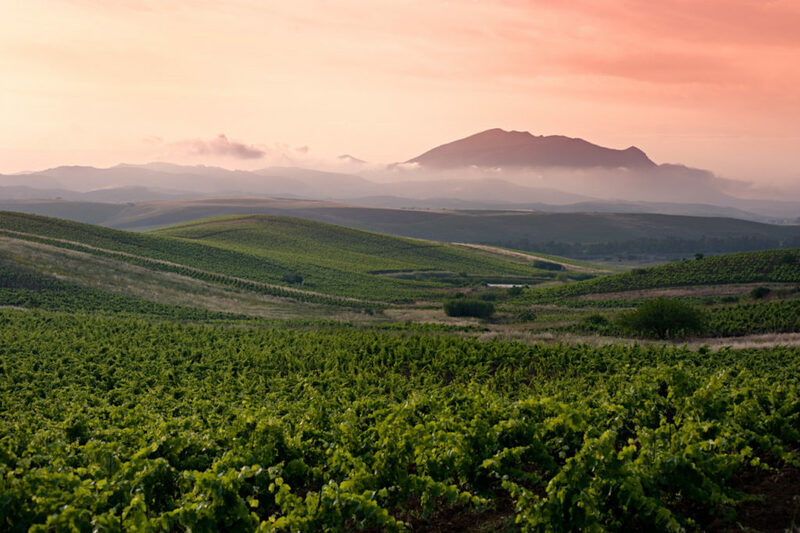 “The renaissance of Sicilian wines began in the ‘90s, when some producers finally decided to focus on quality viticulture instead of quantity,” says Spatafore. Monaci Delle Terre Nere in the foothills of Sicily’s Mt. Etna. Image by Sherry Stolar. Sicily was well into this renaissance in 2007 when Coffa and Calabrese bought the Monaci property in Etna, a noble dwelling which dates back to the 19th century. Coffa had enjoyed a successful career as an engineer, a profession which took him all over the world, including working stints in the U.S. Calabrese had been a dentist in the nearby city of Catania. They lived at Monaci for five years while converting it into a hotel that opened in 2012. “I became a farmer to stay at Monaci,” Coffa told me as he guided us on a tour of the property. The hotel’s Convivium Bar is housed in the property’s old cellar, known as a palmento in Sicily. These historic stone rooms were once operated as gravity-flow systems to crush the grapes and ferment them into wine. 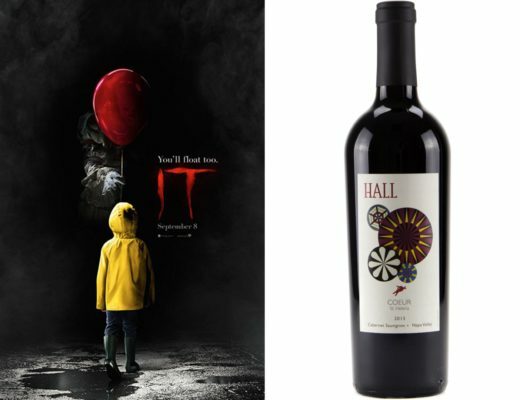 While Monaci’s palmento is no longer used for its originally intended purpose (though the wooden press is still intact), Coffa is still making a small production of wines from vines on the property. 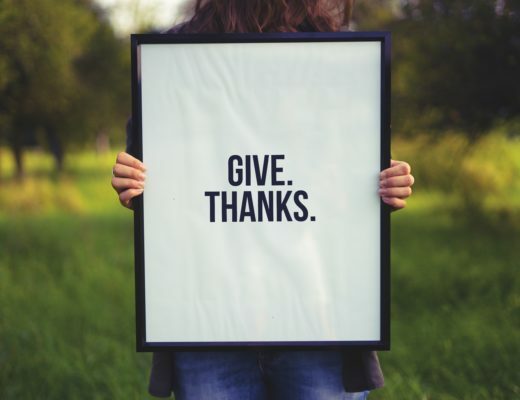 Coffa credits what he’s built at Monaci to the international bestseller The Secret and its concept of “the law of attraction,” essentially that we can focus our thoughts on what we want to attract into our lives. 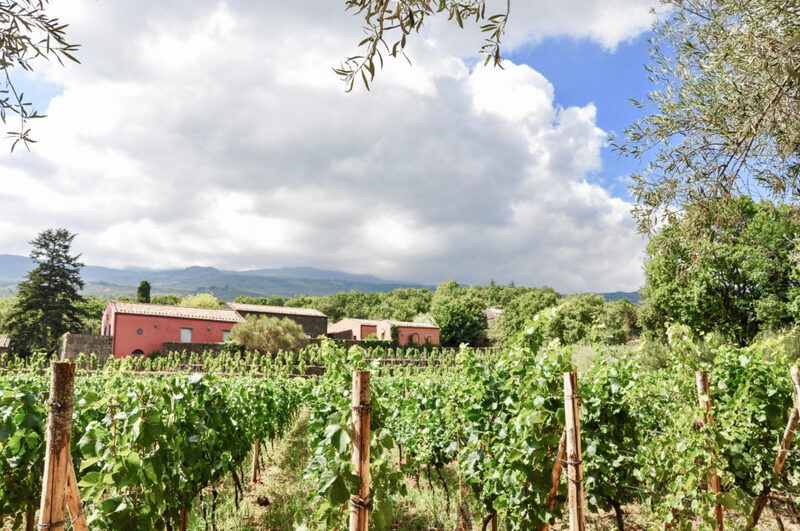 He plans to add another approximately 15 acres to his five acres of vines planted to varieties including Nerello Mascalese and Carricante, a white grape grown uniquely in Etna. We tasted the 2016 Guido Coffa Carricante from Mt. Etna during our incredible five-course dinner at the estate’s restaurant, Locanda Nerello, prepared by the property’s young but supremely talented chef, Bleri Dervishi. Bleri hails from Albania, where he won the country’s version of Master Chef. The wine was bright and crisp, with notes of pear, green apple, fennel, and licorice, pairing exceptionally well with Dervishi’s superb carrot and ginger risotto with grape must and yogurt. It was spicy and sweet, and so delicious that we were licking our bowls at the end without the slightest hint of shame. Starting with the green and creamy pistachio soup with egg, each course was better than the next, the dishes elegant and seemingly simple combinations, yet the flavors intensely vibrant. Of course, we finished with the traditional Sicilian pastry, the cannoli, a homemade version with lightly whipped sweet ricotta cream and a mouthwatering pistachio sorbetto. Terrazze dell’Etna on the northwest slopes of Mt. Etna. Image by Sherry Stolar. Perhaps there’s something in the Etna water (or lava?) for former engineers. In 2008, around the same time Coffa and Calabrese began work on their property, Nino Bevilacqua, an engineer from Palermo, harvested his first vintage of Terrazze dell’Etna. Visiting the property on a warm, overcast day, we wandered the vineyards with our gracious host, Fabio Vassallo. Vassallo had spent more than a decade in the U.K. working as a wine distributor, but like Coffa had felt a calling to come back to his home in Sicily. He is now the commercial manager for Terrazze dell’Etna. Hand-harvesting is the norm here, which isn’t surprising when you get up close to the fragile, bush-trained vines. Many of these are 80-200 years old, some pre-phylloxera (a pest that nearly decimated most of Europe’s vines in the early 20th century) and all Nerello Mascalese, the main grape planted at Terrazze dell’Etna. In 2010 and 2011, the winery started making a rosato and a still white from the variety (though others had attempted to produce a white wine from the Nerello Mascalese grape in the 1990s, none were successful). The 2016 Terrazze dell’Etna Ciuri Vino Bianco, Sicily, Italy, a white from Nerello Mascalese, was floral and citrusy, with intense minerality, honey, and melon. The Feudo Maccari estate of Antonio Moretti, owner of Tenuta Sette Ponti and Poggio al Lupo in Tuscany. Image by Sherry Stolar. Our last stop took us out of Etna and further south into the region of Noto, the home of Nero d’Avola. We were met at Feudo Maccari, one of two Sicilian outposts from Antonio Moretti Cuseri of Tuscany’s Tenuta Sette Ponti, Poggio al Lupo and Orma, by the young and knowledgeable Alessandra Pagliaro. The portfolio also includes Contrada Santo Spirito di Passopisciaro in Etna. 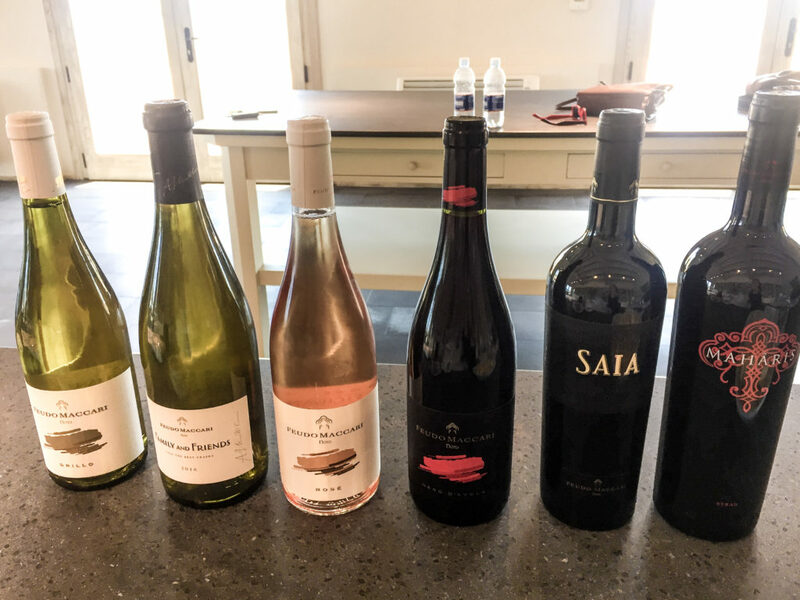 With Pagliaro, we tasted through six of Feudo Maccari’s current releases, the most impressive of which was the 2014 Feudo Maccari Saia made from Nero D’Avola and aged for 12-14 months in French oak barrique and six months in bottle. The wine has notes of tea leaf, cranberry, smoke, and pepper, with bold tannins. In true Sicilian hospitality, we then drove off with Pagliaro to the nearby town of Marzamemi to enjoy lunch in the small fishing village on the sea. Because by then, we were practically family. Sherry Stolar holds a Diploma of Wine Studies from the Wine & Spirit Education Trust and a BS from Cornell University in Communications. She first fell in love with wine while living abroad for a month in Torino, Italy. While she began her career in global financial services, she spent her nights and weekends working in wine retail shops. In 2010, Sherry relocated from New York to Napa Valley to join the wine industry full-time. From London to New York to Napa, Sherry has held various roles ranging from sales, marketing, events, and wine education. She is currently based in London, where she’s an MBA candidate at London Business School, and contributing to The SOMM Journal, Vivino, and the Napa Valley Wine Academy.